Chelating Agents, also called complexing agents, are substances that combine with metal ions to produce stable, water-soluble structures called chelates. Thereby, their physico-chemical behavior changes, such as their reaction properties and solubility. Chelating agents are used above all in detergents and cleaners to lower water hardness, but also for industrial applications, food processing and medicine. The market research institute Ceresana expects worldwide demand for chelating agents to rise to more than 4.34 million tonnes by 2022. Demand for chelating agents will only rise slightly on the saturated markets in Western Europe and North America. They are characterized by product substitution. Environmental concerns are having a significant impact on the use of the controversial sodium tripolyphosphate (STPP) in the European Union as well as in Canada and the USA. Many manufacturers are voluntarily refraining from applying STPP. Governmental prohibitions and quantitative restrictions are becoming more and more efficient as well. In Europe, demand for STPP in household washing powders already fell significantly until 2015. By 2017, this trend is expected to lead to a clear volume decline of STPP for dishwashing detergents as well. Chelating agents analyzed in this market study are among others STPP, phosphates, EDTA, NTA, and DTPA. Apart from those conventional chelating agents, above all environmentally friendly chelating agents are featuring strong growth dynamics. Biodegradability is most important in order to prevent long-term consequences for humans and the environment. Alternatives such as citric acid, GLDA, MGDA, EDDS, IDS, gluconic acid, and glucoheptonates constitute a large proportion of the sales volume of other products that are expected to rise globally by 2.4% p.a. In 2014, the most important sales market for chelating agents were washing powders. This application constituted about 60% of total demand. Even though the majority of chelating agents is used for household detergents and cleaners, there is also a variety of industrial sales markets. Those are, among others, the pulp and paper industry, textiles and leather, the food industry, and medicine and cosmetics. The pulp industry was the largest consumer in 2014 with a volume of about 150,000 tonnes. Chelating agents are used for manufacturing bleached chemical pulp and for de-inking recycled cellulose pulp. Chapter 1 provides a presentation and analysis of the global market for chelating agents, including forecasts up to 2022. Demand development is discussed for the regions Western and Eastern Europe, North and South America, Asia-Pacific, the Middle East, and Africa. 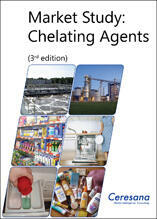 Chapter 2 examines the market for chelating agents of the 16 major countries in more detail. Demand volume of the individual applications is described in detail. Chapter 3 discusses the applications of chelating agents. The demand development is examined for the applications washing powder, dishwashing detergents, household cleaners, other detergents and cleaners, industrial and institutional cleaners, and industrial products. In Chapter 4, demand for individual types of chelating agents is analyzed. Individually covered are sodium tripolyphosphate (STPP), phosphonates (ATMP, EDTMP, DTPMP, HEDP, PBTC, and HDTMP), ethylene diamine tetra acetic acid (EDTA), nitrilotriacetic acid (NTA), diethylene triamine pentaacetic acid (DTPA), and other products (citric acid, GLDA, MGDA, EDDS, IDS, GA, PDTA, HEDTA, glucoheptonates). Chapter 5 provides profiles of the largest producers of chelating agents, clearly arranged according to contact details, turnover, profit, product range, production sites, and profile summary. More detailed profiles are given for 99 manufacturers, including Akcros Chemicals, Akzo Nobel, BASF, Chelest, Dow, DuPont, Hebei Smart Chemicals, Innophos, Jungbunzlauer, Kemira, Lanxess, Prayon, Protex, Tata Chemicals and Zschimmer & Schwarz.